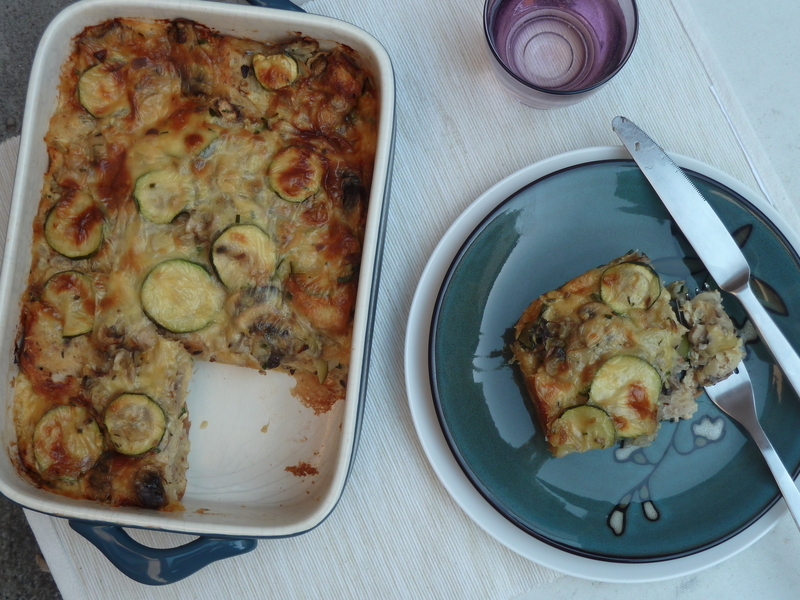 Listen up and listen well my friends: this Mushroom and Zucchini Strata must chill overnight. Or at for at least five hours. Why? I’ll get to that later. I simply felt obliged to point this fact out to you now, rather than just before you cheerily go to put it in the oven. Discovering that what you had prepared for tonight’s dinner is now destined for tomorrow night will wipe that happy “I’m all prepared” smile right off your face. Been there, done that. And that is why I’m covering my back by giving you fair warning straight from the start. Two words: plan ahead. Hang on a sec, I can see you’re about to skip to another recipe. I understand – I do that too. Please stay. Planning ahead isn’t a drag (well at least not all the time), it’s actually very useful. Planning prevents situations where you’re frantically searching the net for a quick, tasty recipe to cook. Right. Now. 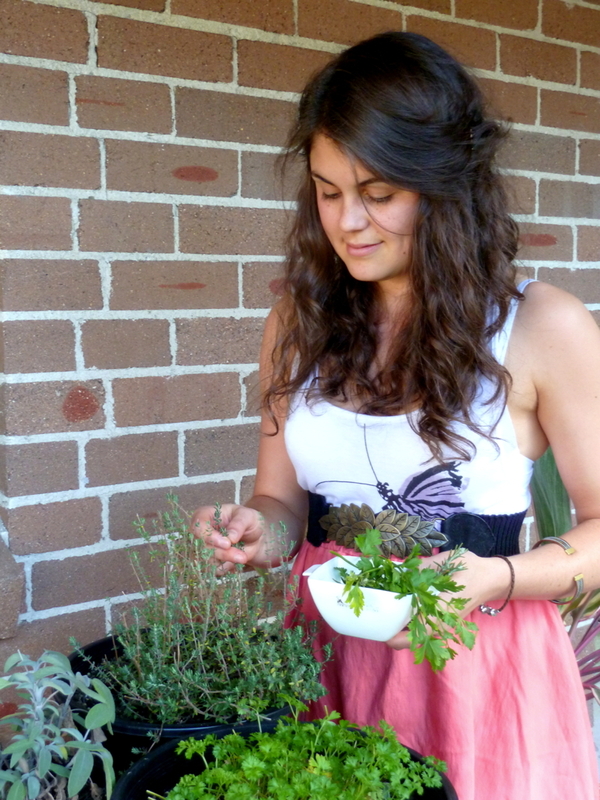 It’s much nicer to still spend more time than you really should looking for recipes (because if you’re anything like me it’s an addiction), but with no sense of immediacy. And all the chill-time induced waiting will only whet your appetite for this strata even more. It’s lip-smacking good. Shall I explain why you have to wait so darned long for it? Sounds like a plan. A strata is essentially like a big baked French Toast, with lots of other interesting bits and bobs added. In this case you’ve got a layer of bread topped with a layer of mushroom-zucchini-onion mixture and then shaved cheese. The process is then repeated and finally an eggy-herby mixture is poured on top. The goal is to have the bread soak up the eggy mixture and all those scrumptious mushroom juices so that when it’s baked it transforms into a slab of soft, moist, rich, slightly cheesy deliciousness. Thus the need for chilling/resting becomes apparent – you want to maximise the time the bread has to soak up all the liquids. By all means bake it straight away, however you risk the chance of ending up with a scattering of dry bread interspersed with bits of scrambled egg. It’s also likely that your strata will refuse to hold its shape when cut. So we chill the strata. Capisce? Most stratas contain a rough-textured bread, whether it be pane di casa, sourdough or the like. However, I prefer to use bog-standard sandwich bread as that is what is more commonly found in our freezer. It’s simply a matter of convenience. As to the type of sandwich bread, just go with what floats your boat (or more practically – what you have on hand). I have used rye and multigrain and both work well. If nothing else, the rye gives it a pop of colour! The end result is far moister and less ‘textured’ than stratas that use sourdough etc. I don’t believe either is better than the other. Just different. In the end you still have an eggy, bready, cheesy meal…you can’t really go fundamentally wrong with that, can you? In terms of cheese you want something nice and melty. The creamier the better. Gouda works a treat, however provolone also produces great results. Again, just whack in whatever you can scrounge up from the fridge. We tend to eat this strata for dinner with a crisp salad, however it would also make a pleasant breakfast or brunch, particularly as all you need to do is pop it in the oven when you wake up! Any leftovers can be kept in the refrigerator for two to three days and reheated gently under a grill, without any detrimental effects. 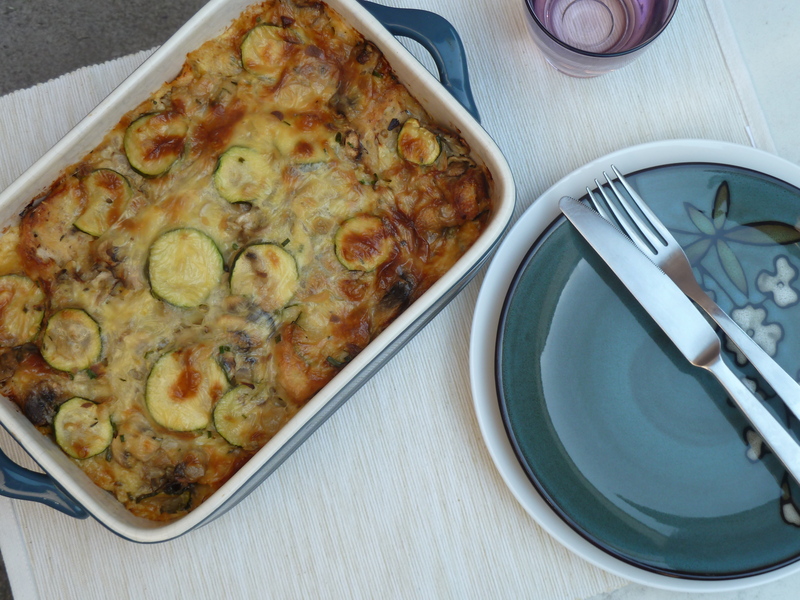 This Mushroom and Zucchini Strata is pretty flexible in ingredients, however one instruction that must be adhered to is to refrigerate overnight. I’m starting to sound like a parrot aren’t I? 150g good quality melting cheese, thinly sliced. Gouda or provolone work well. Heat oil in a large frying pan. Saute the onion and thyme over a low heat, stirring regularly, for about 3 minutes or until softened and almost translucent. Add the garlic and cook, stirring for half a minute or so. Toss in the sliced mushrooms and zucchini and cook for 6-7 minutes, stirring from time to time, or until they begin to release their juices and soften. Season with half the salt and a good grind of black pepper and remove the pan from the heat. While the veg is cooking, whisk together the eggs, milk, mustard, chives and remaining salt. Season well with pepper. Lightly grease an 18cm by 25cm or similar oven-proof dish. Spread half of the bread evenly over the bottom of the dish. Now spread over half of the vegetable mixture and arrange half the cheese slices on top of that. Repeat the process. Pour the egg mixture evenly over the top. Cover with clingfilm and refrigerate for at least five hours, preferably overnight. Preheat the oven to 190C. Remove the strata from the fridge and let sit at room temperature for about half an hour. Remove the cling film and bake for 45 minutes or until the center is firm when touched and golden brown on top. Place the dish on a wire rack and leave to rest for 10 minutes before serving.